The execution of the stories were of varying quality, but generally were all good. Personally, I found the more cartoony drawings didn't seem to fit as well with the types of stories that were being told, but my understanding is that he storytellers themselves were able to choose the artists who depicted their tales. So I have to assume that they felt that there weren't any stylistic problems on that front. The biggest disconnect I had was more of a cultural one. Many tribes have rich histories in storytelling, but it's distinctly different type of storytelling than most Americans and Europeans are accustomed to. So there are story leaps that don't necessarily make sense as far as we might be concerned. Many of the explanatory tales, for example, start with the assumption than things used to be radically different, with no real further explanation. According to legend, alligators used to be yellow. But he got caught in a fire and that's why his skin is brown and dry-looking now. Of course there's no explanation on why his skin was yellow in the first place, or how he even came into existence; you just have to assume that alligators did exist and were colored yellow sometime before now. Another noteworthy assumption is that the animals in the stories were, for the most part, not any individual animal but the collective spirit of that whole species. When you're reading a story about Wolf trying to fly, that's essentially EVERY wolf. There is no wolf (lower case "w"); Wolf (upper case "W") is all the wolves of all time rolling into one being. Oh, and animals have human likenesses which they can switch back and forth between at will. Useful bit of knowledge there, especially for the first story. One final cultural distinction I'll make is that Native American stories don't necessarily follow what we might consider a "typical" story progression. Things happen, and they unfold an easy-to-follow narrative fashion, but they don't necessarily lead up to anything. The story climax can wind up being decidedly anti-climactic. I mention these differences NOT as detriments to either Native American storytelling or Trickster specifically, but mainly to highlight that it's not unlike picking up manga for the first time. 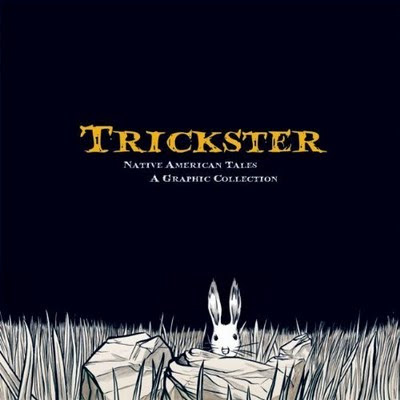 If all you've read are what might pass for "mainstream" U.S. comics, you're going to need to experience a bit of a mental shift before really getting into Trickster. You remember the first time you read manga and started turning the pages "backwards"? Eventually you got accustomed to it, and you were fine. 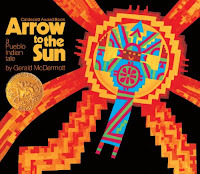 Native American tales are little like that at some level. Not as overtly and visibly different as that, but it takes a bit to get used to. The reason for that, of course, is that there are so few outlets that bring Native American storytelling to us. I went to a small convention back in 2007 that highlighted Native Americans in comics. While there were several creators of Native American heritage there, and there was plenty of talk about how Native Americans were portrayed in comics (primarily of the laughably bad 1950s Western variety), there was little to show by way of actual Native American style storytelling. Even contemporary, smart, well-researched stories followed fairly standard Western storytelling conventions. This general ignorance is, of course, largely deliberate on the part of Americans. After the obscene treatment natives were given over a period of centuries, the only way we could collectively justify it was to pretend it never happened. Or downplay the events and put as much spin on it as possible. So we have happy pilgrims and "indians" at Thanksgiving. Or games of cowboys & indians in which the cowboys were ALWAYS the clear heroes. You know, it is great that you can out and read something like Scout and there's at least one book out there looking at how Native Americans are portrayed in comics. But I think more collections like Trickster would do a world of good, even if the individual stories aren't always what most Americans expect.